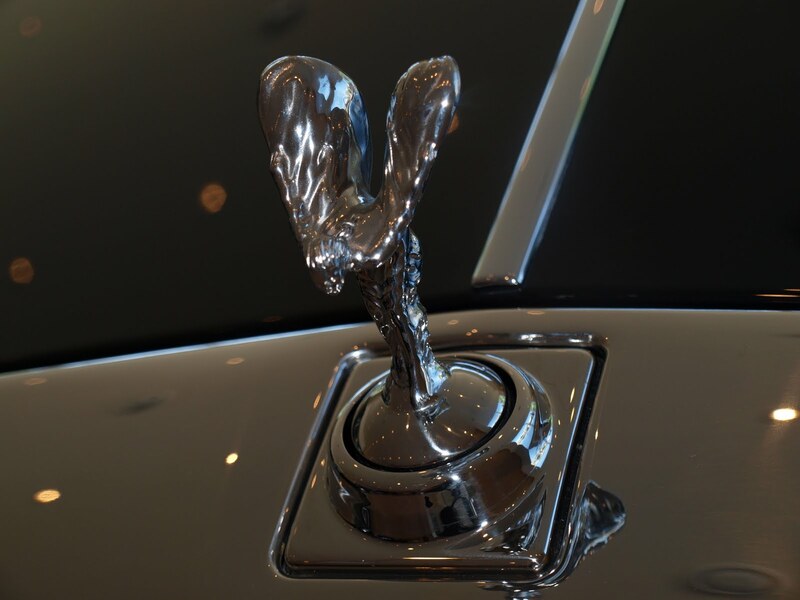 This is the Spirit of Ecstasy. I still call it the Flying Lady in my brain, but Rolls-Royce is quite proper. Coach doors are not 'suicide' doors. But in my head they are. But the beauty of the Rolls-Royce people is that no matter how stupid you sound in front of them, they all smile politely and assure you that you're always right. I feel like a 3-year-old toddler in the hospital, sometimes. But it's all quite soothing and reassuring, and it ends with a chance to drive a car worth as much as a house, if not endless ice cream. I was chatting with a friend about the new Ghost. The one I drove was Metropolitan Blue, a gorgeous bluey-purple. She decided it would match her eyes, and therefore she should have one. I told her that RR would actually produce a car to *exactly* match her eye colour; that is what they do. I considered this after I said it. My minivan is something called Stealth Grey. It is blue. It does not match my eyes, nor did they offer to. I was into Toronto twice yesterday (don't ask), and I really need to know this: where were you all going yesterday? Every single artery was clogged into and out of the city all day. It was a glorious hot day to spend at a beach or on a deck. So, why were so many of you in your cars? Oh, a friend I visited was at Cherry Beach with her kids. Check out her hilarious cartoon of her experience. I bet you didn't ever hear of the predecessor to the Rolls Royce. It's called the Rolls-Cunardly. Why? Because it rolls down one side of a hill but cunhardly roll up the other. Never mind. I'm going for my nap now. OMG, that drawing is hilarious. It reminded me of an older artist who did a parody of Coney Island way back in the previous century...Paul Cadmus was his name. Thanks Roz, but shh...I love getting paid. And Buzzwhack? Thanks for bringing up Paul Cadmus. He's uhhMAZEing. I used to visit his painting 'Sailors and Floozies'and marvel. I WISH I could do that. You're welcome, Tonia. Good art is scarce these days.